Dentures are removable replacements for missing teeth. Depending on your oral situation, you may require complete dentures or partial dentures. If you’re a first time denture wearer, you may have some concerns. Although it may seem daunting, the denture process is a breeze when you use our services because we come to your location. Dentures are custom-made removable teeth replacements. They are used to replace some or all missing teeth. Dentures come in different types and can be fit to any mouth, regardless of age. Although dentures are generally considered useful for seniors, there are many people in Canada of all ages who wear them. Dentures are made to resemble natural teeth in their form and colour. They will appear like your organic teeth and after a while, you will barely notice you are wearing them. Dentures come in partial, complete and overdentures. Each type is removable. Partial: This type of denture is used when only a few teeth are missing. They are also used when the nearby teeth aren’t strong enough to hold a bridge. Partial dentures use clasps to fit onto the surrounding natural teeth. Complete: These dentures are what you may have heard referred to as “false teeth” or “full dentures”. Complete dentures offer an entire set of teeth and are held in place via suction. You can have immediate complete dentures or conventional complete dentures. 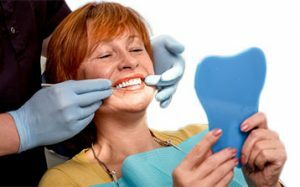 Immediate means they are made before your teeth are removed, whereas conventional dentures are inserted into your mouth post-removal and your gums and tissues have fully healed. Overdentures: These are dentures that fit over your natural teeth or dental implants. Overdentures attach to the implants or can rest snugly on the natural teeth. Dentures offer many benefits, the most important one being that they are a replacement for missing teeth. They can also help you eat and speak more clearly and restore function to your mouth. Whether you have lost a few teeth or all of your natural teeth, dentures will provide you with a healthy smile. Dentures can also give you your confidence back. For many people, missing teeth makes them self-conscious and afraid to speak or open their mouth in public. With dentures in place, you will no longer have to shy away from speaking or opening your mouth when you’re in the company of others. Will you really come to my home? Yes! We are a mobile denture clinic and we service the entire city of Calgary and its surrounding areas. We feel that it is important for us to visit our patients where they are the most comfortable; in their own homes. For those who are getting dentures for the first time, it can be an overwhelming experience and we aim to make the process as smooth as possible. Do not hesitate to contact us if you have questions or are apprehensive about your first time dentures. We are here to help.